One classic Valentine’s Day gesture is the act of sending flowers to your loved ones, with chocolates and adorable teddy bears optional. The beauty of the bouquet does not end at the freshness of the blooms, however. Thanks to time-tested legends from different cultures, countless generations of romantics, and flower enthusiasts, each type of flower included in your bouquet may now carry a certain meaning. This means that through an arrangement of cut flowers, you can send a wordless and custom-tailored Valentine’s Day message to the one you love! For this reason, it’s important to know the perfect Valentine’s Day flowers that will convey your feelings and guarantee to win someone’s affection. 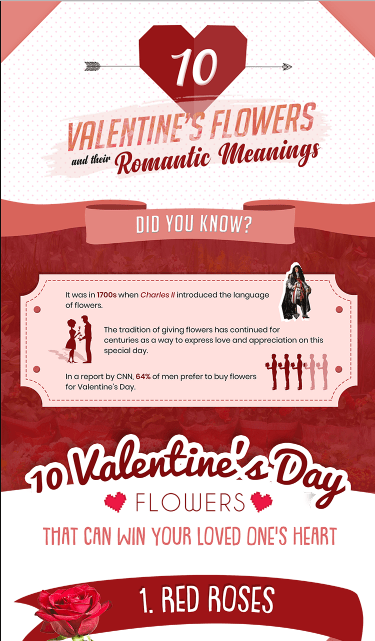 To help you with your search, Flower Patch, a flower shop in Pasig that offers same-day flower delivery services in Metro Manila, presents this infographic that will guide you through 10 Valentine’s flowers, along with their romantic meanings.